This plaque is not Original to the cemetery. It was added sometime between 1960 and 1980 and lists, hopefully, all the people in the cemetery. However some of the names are a little off. It also gives dates for most, but there are several without, possibly infants. At the top is Samuel Birch, then his First wife, Carey Ann Richards, his second wife, Annie Cleveland, his infant grandson, Howard Birch, his daughter Annie Birch Payne, his daughter Sarah Jane, and his daughter Carrie Birch. 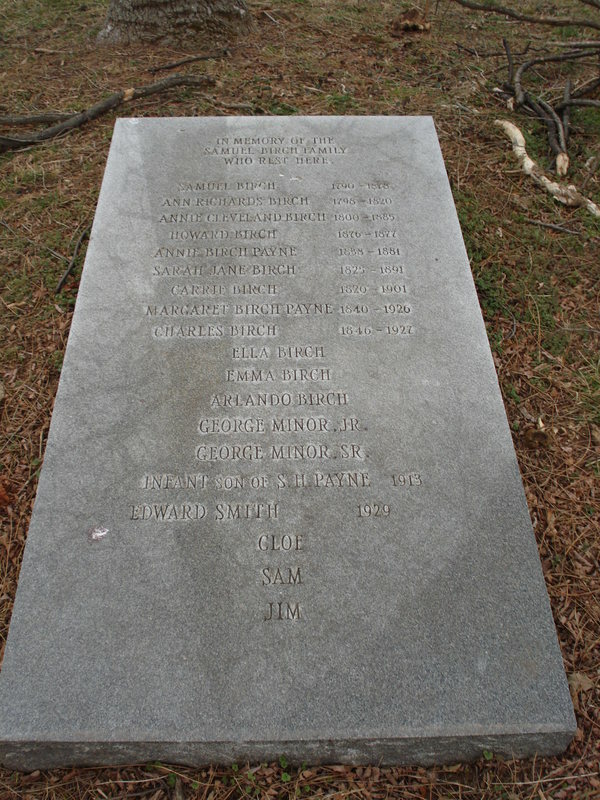 After Carrie Birch, is Samuel's daughter Margaret Birch Payne, Charles Birch, and some un-dated people, possibly infants, Ella, Emma, Arlando, George Minor jr., and George Minor sr.
After George Minor sr, is the Infant son of SH Payne, Edward Smith, and Cloe, Sam, and (not shown) Jim.